I am crying as I write this. My emotions are so raw these days. 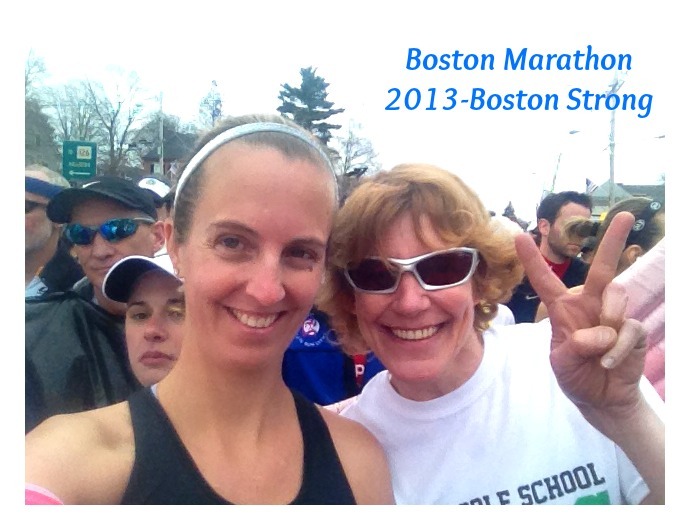 I am going to share pieces of my Boston Marathon experience as the weeks go by. It is hard to share it all at once. This evening I learned that my friend Lynn who started the race with me drove down to pick up her Boston Marathon Medal today. Today was the day they would reopen Boylston Street to the Public. Today was the day that Lynn would run to finish the marathon, the day that she would run for the 170 victims at the finish line. To give you a little history, Lynn and I first met when I was teaching first grade. I was her sons first grade teacher, a sweet blond haired boy with the whole world ahead of him. A boy somewhere around the age of the youngest victim of the Boston Marathon tragedy. Full of vivid imagination and endless ideas. Full of energy and a wide smile that would light up when he would read me his stories and show me his discoveries on the playground. I lost touch with Lynn for awhile but am forever bonded for being her sons teacher for showing him how to gain confidence as a reader, as a student. Every child has a vivid bright light and fresh energy. The world waiting . . . the whole world ahead of them. It is not fair that a boy (Martin Richard) who was just like my student, like my friend’s son, should have this light taken away too soon during the terrible tragedy at The Boston Marathon. Lynn and I have reconnected through running and it is a bond that we share. Lynn has run the Boston Marathon for many years so I was happy to be able to meet up with her before the race to head to our starting corral. We spent the morning sharing running stories and she gave me helpful tips for conquering the marathon course. We also talked about the Gilford, NH Schools For Schools 26.4.26 race to remember the victims of the Sandy Hook School Shooting. Not being able to be there, Lynn wanted to support the race and had decided to wear the 26.4.26 race shirt at the Boston Marathon. We observed 26 seconds of silence prior to the race and I knew I would be crying at mile marker 26 knowing one of my close friends was directly affected by the loss of her stepmother in this horrific tragedy. Another runner, Jaime, who we met up with before the race was nervous being at the race while her husband was not able to attend due to being on a trip. She expressed how she was worried before coming to Boston for the marathon and had even talked with a friend prior to the race about the possibility of tragedy (terrorism) happening at something such as the Boston Marathon. Our discussion prior to the race gives me chills now . . . was it a premonition . . . a foreshadowing of things to come? Lynn and I made our way to the starting line. I was jittery, race day nerves had definitely taken hold. Eager to get to the start we gathered our belongings into our yellow Boston Marathon Bags and put on the last few finishing touches of our race day outfits. I felt ready to run a strong race and was happy to have Lynn cheering me on all the way to the starting line (and I know she was cheering me on as I crossed the line too.) Just prior to heading to the starting line I helped Lynn by pinning a pair of pink and silver wings onto her back. The wings from the Flying Pig Marathon are something that she has worn now for many miles at many races encouraging race spectators to cheer her on with cries of, “Angel” as she would speed along any race course. Her energy and smile are contagious, lifting you up and inspiring you to be strong and to take on any challenge. Somehow as we made our way to the starting line time evaporated . . . somehow we missed our starting corral and ended up having to start in the Third Wave, Corral Number 2. A slight shift in our own personal timelines for the race. Perhaps fate. In the end of the race I crossed the line with 14 minutes to spare and Lynn was stopped with .4 miles to go. We were lucky. Who knows what would have happened. I am thankful because perhaps for me on this day I was running with a true Angel. I am a believer in fate . . . Here is a picture I took of Lynn and I just moments before the gun went off at the start of the marathon . . .
She holds up a sign of PEACE. Today Lynn drove down to Boston after hearing that race medals would be handed out to the people who had not reached the finish of the marathon. Today Lynn finished her race. Today Lynn finished for all of the people who did not finish. Today she finished to remember the victims. Today Lynn finished to show the world that Boston is Strong. Here is her story as told by her significant other Hal (who was sitting in the bleachers) . . .
And when I read these words my tears began to fall . . . This is a very touching story, and sad at the same time. I think Lynn knows what so many know – love and courage are stronger than anything else. I had no words tonight just feelings of love for Lynn and for everyone uniting together in a time of tragedy. 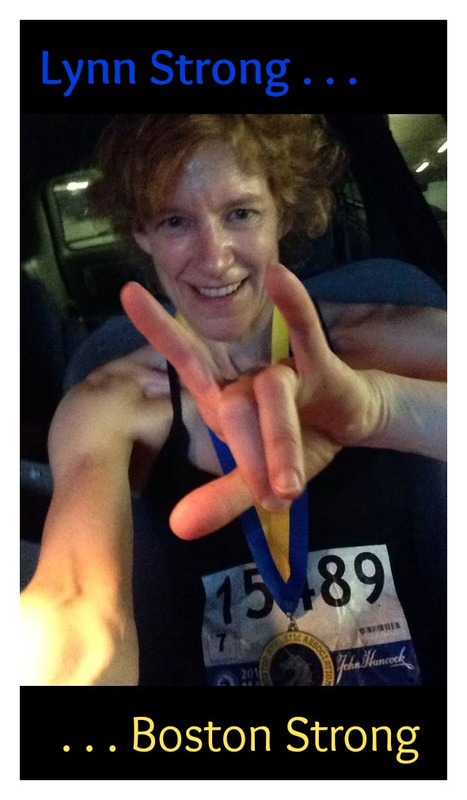 I can just imagine the tears streaming down her face as she ran down Boylston Street this evening. Running brings us together as a community- we share this common bond whoever we may be and wherever we are. I feel connected to you as the writer of this story and to Lynn as the runner. Boston Strong, and “yes” Lynn Strong. Thanks for sharing . What a great story and congratulations to Lynn and all the others . Wow! I can see why you were crying when you wrote this – so touching. What a great moment for Lynn and now all of us who hear her story! Thanks for sharing this with us Sandra! There truly are amazing people in this world. Thanks for sharing and letting us be a part of the story! Thank you so much for sharing this. It’s so sad, yet so inspiring <3. *hugs* Lynn Strong for Boston Strong indeed! Oh wow. What a touching story. Thank you for sharing it. Love this. Runners truly can’t be stopped. What a deeply personal and touching story you’ve shared. As a running community, I know we were all affected by this horrible attack. It gets more personal though, when I hear such first-hand accounts. I absolutely believe in fate. Thank you for writing this. I love hearing touching stories like this. We need more of this and less of the yucky ones. I don’t want to hear about the evil men who did this anymore. God Bless you and Lynn… Stay strong! What a lovely and touching post Sandra. Thank you to both of you for bringing us your story and personal events of that sad day. What a beautiful story of courage. Wishing you all the very best in your studies toward becoming a Certified Holistic Health Coach. Such a moving story, thanks for sharing, Sandra. I’m sure your emotions are quite raw, and it will take a long time to heal. Stories like these can help us all as we start to move forward again. Pingback: Skirt Sports. Real Women. Real bodies. Real inspiration. Pingback: I dedicate this run to you. Boston Marathon 2014.